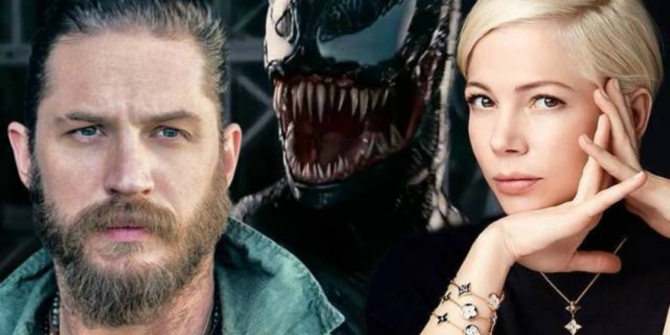 Ever since Ruben Fleischer’s Venom took the defining step into production, the Internet has been awash with candid set photos and leaked videos featuring Tom Hardy in character as the haunted Eddie Brock. Thanks to IGN, though, the other week finally saw the release of Venom‘s first official photo. Unfortunately, however, it wasn’t much and didn’t even give us a look at how the titular antihero will appear in the film. True, we’ll take what we can get at this stage, but it was wholly underwhelming and as such, fans are left wanting more. After all, there aren’t many in-development comic book movies that’ve garnered the same level of buzz as Venom, are there? With the exception of Avengers: Infinity War, the upcoming Spider-Man spinoff has been placed under such an intense spotlight that it seems like we’re never too far away from the next piece of content – leaked or otherwise. And sure enough, we’ve now got another set video. Like that aforementioned photo from IGN, though, it’s not terribly exciting and simply shows Hardy and Michelle Williams having a chat. But if it’s anything and everything Venom you’re after, you can check it out down below. Speaking of Williams, the actress finally confirmed not too long ago that she’s playing Anne Weying in the pic. Of course, this is a name that comes with a loaded meaning to fans, as Weying becomes She-Venom in the comics, after she bonds with an offshoot of the savage symbiote. So, what are we to think then? Well, it’s far too early to say for sure what’s going on with Williams’ character in the movie, but fans shouldn’t be too cut up if She-Venom isn’t involved in the production. After all, there are a whole bunch of other symbiotes likely to show up instead. Multiples sources – including director Ruben Fleischer and Tom Hardy – have cited comic book inspirations for the project that feature six different symbiotes. Namely, Carnage, Scream, Phage, Riot, Lasher and Agony. As such, there’s still more than enough to look forward to when Venom swings into theaters later this year on October 5th.